I have been putting my thoughts to electronic paper (i.e. writing a blog) for nearly seven years. Over that time a number of people suggested that I also write a book, but I always resisted this idea in the belief that I already had a publishing space and also that a book would be the equivalent of ‘freezing’ a set of ideas in an environment which is fluid and changing. However, looking back at the speeches and presentations I have given over the last couple of years, I realised that I have been saying basically the same thing for a while anyway. I have become frozen, or perhaps a better way of saying that is that my ideas have settled into a coherent sort of groove. I also realised that it might be useful to come up with a single distillation that draws together thoughts that otherwise lived more chaotically on this blog and that doing this with a single 40,000 word post might not be all that sensible. Far better, and potentially more lucrative, to do this in a format accessible via these new-fangled e-readers, one of which even I now possess. Social media: it may be social but it is not media. 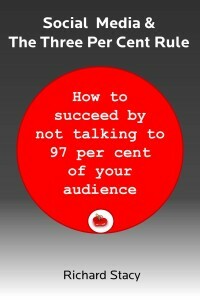 If you think you can use social media to reach your target audiences you will end up wasting lots of money. If you use social media to establish valuable relationships with individuals or very small groups of people (at any one time) you will save lots of money. Most organisations, including some of the biggest names in brand marketing, have not yet figured this out. This book torpedoes much of the current thinking about how an organisation can use social media effectively, exposing the vested interests that drive organisations to make the wrong decisions as well as explaining how it is possible to use social media in a way which is both effective and measurable. It also explores some of the broader issues that define the world of social media and the longer-term implications for brands, the media, governments, Mark Zuckerberg and society as a whole (although not necessarily in that order). Introduction: why three per cent? Chapter 1: why are organisations getting it wrong? Chapter 3: who are those three percenters? Or if you want to pay in US$ here. Richard – we should talk. We have accomplished everything you describe in your book. Excellent work.